Chemical Thermodynamics for Industry presents the latest developments in applied thermodynamics and highlights the role of thermodynamics in the chemical industry. Written by leading experts in the field, Chemical Thermodynamics for Industry covers the latest developments in traditional areas such as calorimetry, microcalorimetry, transport properties, crystallization, adsorption, electrolyte systems and transport fuels, It highlights newly established areas such as multiphase modeling, reactive distillation, non-equilibrium thermodynamics and spectro-calorimetry. It also explores new ways of treating old technologies as well as new and potentially important areas such as ionic liquids, new materials, ab-initia quantum chemistry, nano-particles, polymer recycling, clathrates and the economic value of applied thermodynamics. 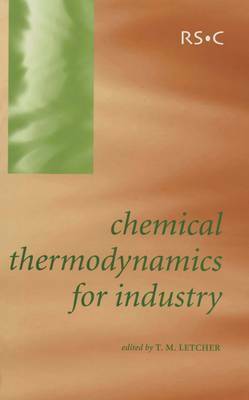 This book is aimed not only at those working in a specific area of chemical thermodynamics but also at the general chemist, the prospective researcher and those involved in funding chemical research.